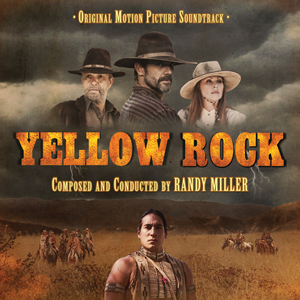 Randy Miller's sweeping score for Yellow Rock provides the traditional feel of a western, while blending in traditional Native American music -- two compelling genres for any composer, merged into a single film. His score builds tension for the deadly cowboys, juxtaposing this tension against the peaceful, spiritual beauty of the Black Paw Tribe. At times his score becomes another character in the film itself, drawing the listener into the haunted west of 1880's California. In the film, five men ride into the eerie town of Yellow Rock to rescue a family member and his lost boy. The leader, Max Dietrich, hires mountain man Tom Hanner to guide them into the Black Paw Tribe territory for the search. The group rides in, receives permission from the Tribal Elders to enter and endeavors to trek through the wild land in search of the missing. Once they pass through, the old Indian legend of a curse comes true. Now riddled with yellow rock fever, they must fight the haunted lands, wild animals, and eventually each other in the quest upon this journey. Ultimately, divine justice is met ~ leaving the Black Paw Tribe to live once more in peace...until...the next white man comes along.